Humour is culturally constructed depending on different experiences of a people. It thrives well in an atmosphere of freedom, which makes it possible for people to unleash their creative potential in cracking jokes on certain socio-economic and political realities. The Nigerian democratic space makes it possible for the emergence of ‘stand-up comedians' who often entertain their enthusiastic audience via the English language or Nigerian Pidgin English. This creative venture reflects the innovative, entrepreneurial and imaginative usage of the English language in the entertainment industry. The ‘Alcoholic Talk Show' (ATS) of Klint da Drunk typifies this linguistic discourse. Earlier studies on effects of alcohol on utterances have been limited to those produced by the intoxicated talker. 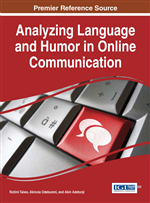 This chapter examines the language performance of a stand-up comedian whose routines are based on drunkenness with a view to identifying the linguistic characteristics of simulated alcoholic utterances. Also, it discusses the exaggerated elements and the social issues in the alcoholic jokes. The data for the study was sourced from selected YouTube recordings of Klint da Drunk and it was subjected to perceptual analysis. The transcript of the video recordings was analysed to identify lingual distortions and social issues raised by the persona, using insights from Bergson's Theory of Comedy. The analysis revealed that ATS manifests lingual distortions and speech dysfluencies that are characteristics of utterances rendered in a state of stupor. The study concluded that thespians do not only dramatise actions but also mime speech styles. Humour and laughter are inseparable and they form vital aspects of human existence. They are universal in nature though they are culturally constructed. Humour refers to the way in which particular cognitive experiences provoke laughter and provide amusement. Sensitivity of human beings to things that can amuse them varies from one social context to another. The form of experience that amuses a Briton, for example, might not amuse a Nigerian, and vice versa. individuals who plant themselves in front of their listeners with their microphones and start telling a succession of funny stories, one-liners or short jokes, and anecdotes…in order to make their audience laugh. This style of comedy involves three essential features which include: a performer who presents a humorous monologue; a live performance before an audience which elicits laughter, and a direct communication between the performer and the audience (Double, 2014). Due to its inherent creative distortion (Minttz, 1985), the performances “work and become a source of humour because they are so well done” (Adejunmobi, 2014:188). The Setting in Nigerian Stand-up Comedy show provides practitioners atmosphere to freely crack jokes and make satirical comments on realities of the Nigerian state and her citizens. Like the ‘fools’ in Shakespearean plays, the stand-up comedians often analyse the threnodic nature of the Nigerian society as a strategy for entertaining their enthusiastic audience via mostly Nigerian Pidgin English and sometimes Standard English. All they do is make the people laugh in the face of misery, wanton neglect and colossal misrule. While not underestimating the entrepreneurial skill of these thespians, this paper focuses on the innovative and imaginative use of the English language by one of them, Clinton Afamefuna Igwemba (a.k.a. Klint da Drunk), in the entertainment industry. Klint da Drunk is a celebrated humour merchant who specialises in Alcoholic Talk Shows (ATSs). ATS is a form of speech that simulates or dramatises expressions made under the influence of alcohol. Alcohol addiction has dire consequences on an individual and a society. Consequently, there is always a growing concern about its consumption. Concerns about the social behaviour of alcoholics evoke a sense of pity, anger or laughter in people. In Nigeria, family members of alcoholics are usually bothered about their social behaviour, but other members of the public get amused at their behaviour especially by their speeches. Klint da Drunk as a stand-up comedian imitates a man called Scatter Mojo who was a real drunk in his village. The comedian admitted in one of his interviews that he found solace in recreating the drunk character, Scattaer Mojo, who was noted for his drunkenness in his village in comic performance (Klint, 2012). It is indubitable that drunken speeches create some amusements for listeners. However, this paper is not investigating alcoholic utterances of a drunk. Rather, it examines the structural and lingual distortions on dramatised inebriated utterances of Klint da Drunk and analyses the strategies he uses in creating humour for his audience. Finally, it discusses the exaggerated elements and the social issues in the routines.